Everyone hears of Maui’s famous resort areas of Lahaina, Kaanapali and Wailea. On the other hand, Kihei is lesser known for swank hotels, but a budget travelers dream. After a recent review on VRBO.com and AirBnB.com, I was able to find vacation condo rentals that sleep two to four for under $100 per night. If you up the budget to $175 to $200, you can easily find attractive vacation rentals with ocean views that sleep up to six. According to this VRBO article, Kihei may be considered Maui’s best kept secret. I tend to agree with them. Though Kihei is not heavily laden with hotels (which can be a good thing), it does offer some nice condo accommodations. Of course, you savvy GoVisitHawaii.com readers already know that staying in a condo can save you lots of money. Why is Kihei cheaper? The vacation rentals don’t offer fancy restaurants, spas and golf courses. They mostly have a residential feel. Though the vacation rentals don’t have all the bells and whistles that you find in most Maui hotels, many do offer lovely swimming pools and access to barbecue grills. Of course, if you want to experience the spas, restaurants, etc at the fancier hotels, you are welcome to do so. You just can’t use their pools. Kihei is centrally located, making it a convenient base to explore the island. Kihei is considered to be part of the South Maui Resorts. 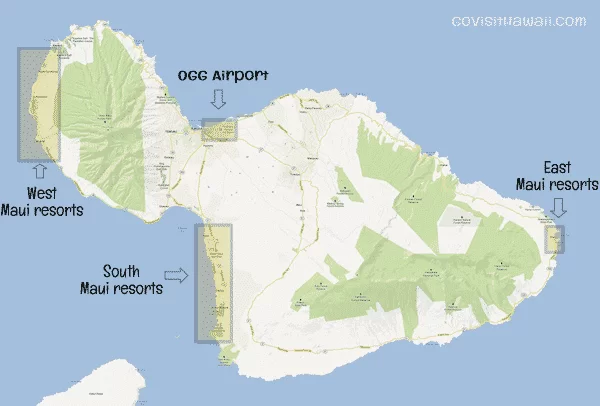 It’s just north of swank Wailea and less than a 30 minute drive from the Kahului Airport (OGG). The VRBO article had some interesting facts about Kihei that I thought were worth mentioning. First, the weather can be fairly predictable. Kihei’s weather is ideal almost year round. Temperatures average between 75 and 85 degrees, and while other areas of Maui tend to have a rainy season from November to March, Kihei averages less than 12 inches per year. Kihei’s largest draw is its fine beaches. In fact, the Kihei coast consists of one wide, sandy, sunny beach after another. Under the attentive watch of lifeguards, these beaches are also considered some of the safest areas in Hawaii. Regular visitors to Kihei learn some of the town’s beaches are renowned for swimming, while others for scuba diving, body surfing, or board surfing. The water remains warm year round, often climbing to 80 degrees in the summer. See more suggestions for where to stay on Maui. Hi, this is great info. Just wondering do you know any site good to look for condos in the Kihei area? Thanks. We are looking to go in Dec.
Is there a public transportation to move from one town to another? or we would need a rental? There is a public bus service on Maui, however stops may not always convenient. Ideally, we recommend renting a car. Hi Sheila, We are flying in and out of Kahului Maui. We have 8 days excluding the travel days. Where would recommend staying? Can we cover one more island probably big island? We are looking for a stay with proper kitchen. Should we stay in Kihei or Wailea to cover everything in Maui? I am looking for a place where there is a Walmart or Costco nearby. Please let me know. The above links were helpful but I am not able to get answer for these questions. Have you looked at Kihei and Wailea on a map? They’re beside each other, so very close. Check Google Maps or some other mapping application for Walmart and Costco and the proximity to the areas you’re considering. Kihei is slightly closer, but there’s not a huge difference. We are visiting Maui for the first time and we have two small children aged 5 and 1.5 Do you recommend taking Hana tour? If so how do we book it? Are there any restrictions for kids? In general, I don’t think small children would enjoy such a long day on an incredibly curvy road and having to get in and out of a vehicle many times.